“Tell us a bit about yourself.” If you’re hearing that question in January, chances are you’re being interviewed to work at one of the most coveted businesses in the world: Las Vegas day clubs. You don’t have to be Neil deGrasse Tyson to know there are plenty of rad things to do in Las Vegas, but we’re pretty sure you don’t know what it takes to work at one of the best pools in Vegas. And you know what? We don’t blame you. Who has time to consider what that security guard or bottle server is doin’ when you’re waist deep in a margarita and raging your face off to Rae Sremmurd or Calvin Harris? But that’s where we come in. We’re going to show you how the sausage is made and let you see what it takes to make sure the phrase, “Vegas pool parties are the best pool parties” lives up to the hype. 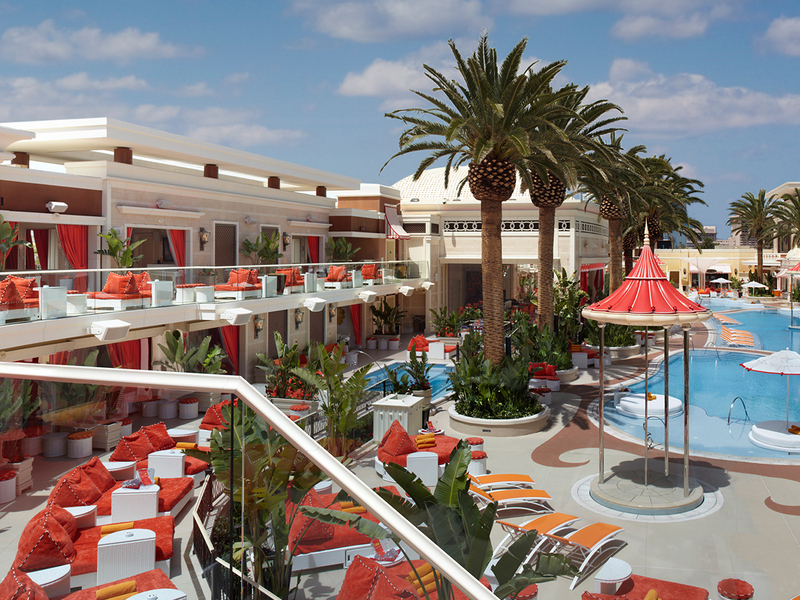 Let’s start with Drai’s Beachclub at The Cromwell. This place is a whopping 35,000 square feet and has a mind-blowing 40 cabanas and bungalows. Think about that. You’re basically partying on a football field. Now add about 2,500 people, cue that gazillion-degree Vegas heat and you can begin to see that working at a day club takes a bit more than a pretty smile or mountain-sized muscles. But what does “a bit more” actually mean? Like, we all want a bit more guac on our burritos, or a bit more money (hey bosses, what up?! ), but usually asking that of your employees can be hard to zero in on. Not for Drai’s though. They got “a bit more” nailed down like that prized family heirloom. To them, it’s not all about whether or not a potential employee has experience. The team at Drai’s can teach proper workplace etiquette with their eyes closed. What they’re looking for is personality. Are you personable? Are you entertaining? Are you friendly? Are you a member of The Partridge Family? Ok, we’re sorta kidding on that last one. 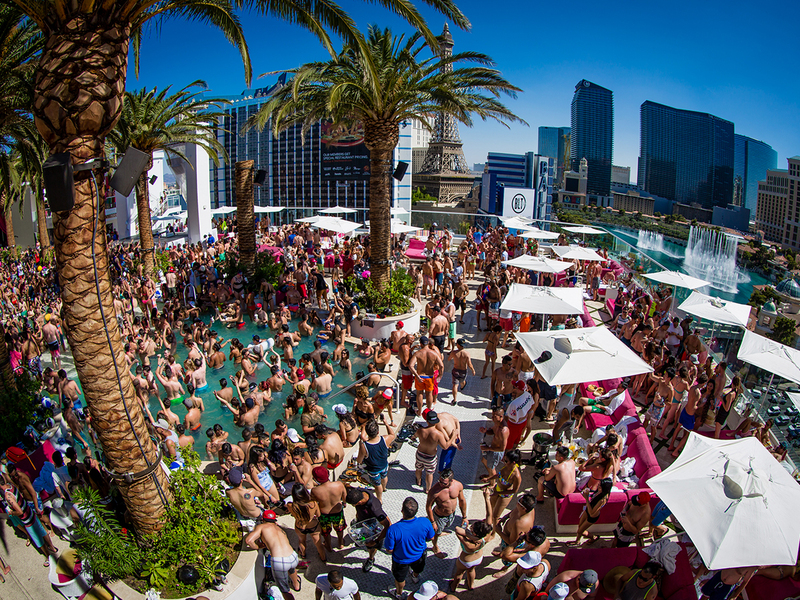 But if we’re being honest, Las Vegas pool parties are a dime a dozen. 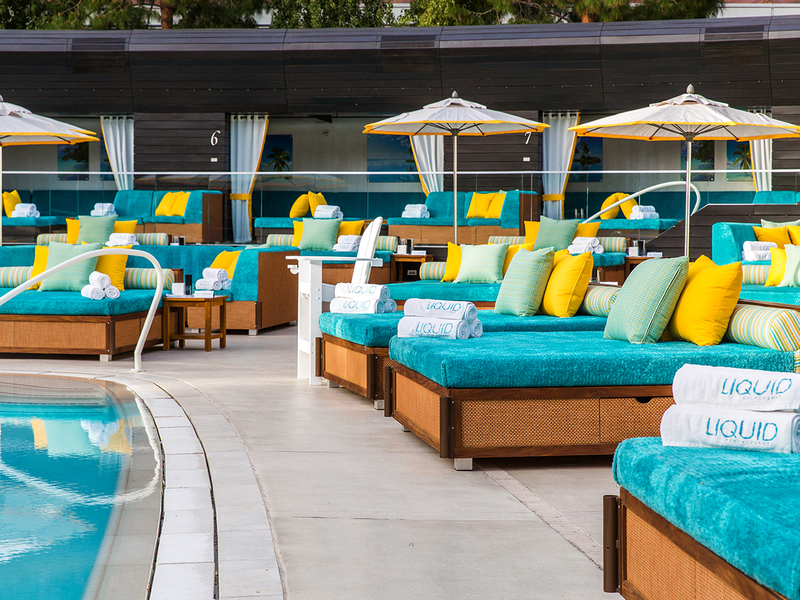 It’s a commitment to the customer experience (and super rad live music) that keeps Drai’s Beachclub in the mix as one of the best pools in Las Vegas. So, an outgoing and accountable personality is what they hang their swimsuits on. 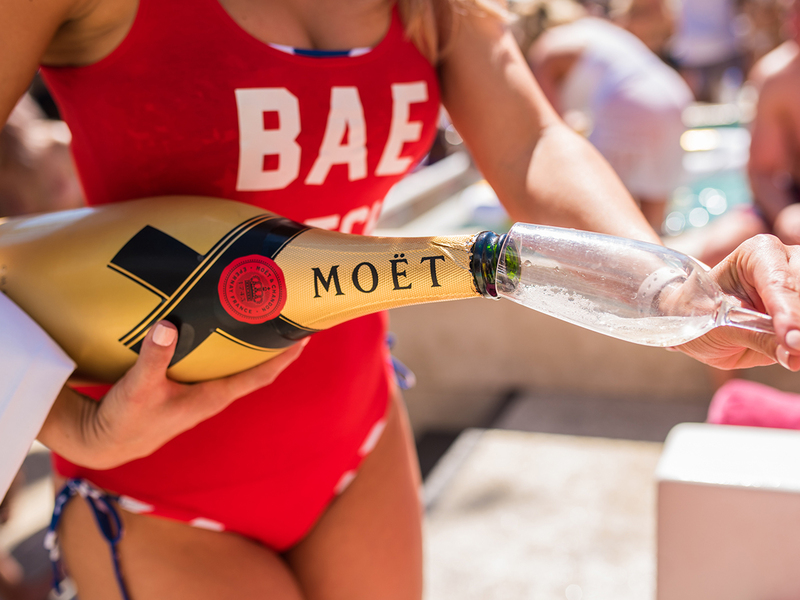 Google “day clubs Vegas” or “pool parties Las Vegas” and you’re sure to stumble upon Wet Republic at MGM Grand and Liquid Pool & Lounge at Aria Resort & Casino. Shiny jewels in the the Hakkasan Group crown, these two venues are as synonymous with Vegas as slot machines and Elvis. But what keeps these spots as easy to remember as your favorite “drunchie” order? Well, the employees at Wet Republic day club and Liquid are able to fall back on the values and standards that made Omnia, Jewel and Hakkasan Las Vegas so successful: service, design, innovation and experience. This doesn’t just apply to the cutie parading that giant bottle of booze to your cabana. It’s also the dude bringing fresh towels and a mop bucket to clean said alcohol once you’re too drunk to correctly put liquor in your glass. And we haven’t even touched on how the marketing teams at these venues work year-round to bring the dopest acts to Sin City. We’ve never wrangled cats before, but we imagine getting an A-lister to Vegas is very much the equivalent. Countless hours are spent talking and negotiating with managers and agents. You have to make sure the money is right, the dates are available, there are no yellow Skittles in the green room, etc. etc. We’d say that “Professional Cat Wrangler” is a fitting job title. Encore Beach Club at Encore has a couple hundred team members working at any given time. We’re talkin’ everything from the ID checker all the way up to an on-site barbecue chef (didn’t see that coming, did ya?). To say that keeping this ship running at full speed is a challenge is like saying “Las Vegas hotels are only OK.” It’s a bit of an understatement. But it’s the staff’s Hallmark Channel type of vibe and desire to deliver that “unique Vegas experience” that keeps these guys and gals coming back to work each and every morning (and seeing David Guetta or Marshmello up-close probably doesn’t hurt, either). Speaking of perks, they have to be pretty sweet. Imagine walking into a job where all day, every day people are trying to recreate “The Hangover.” Free meals or a dap from a celebrity does wonders for the morale. Especially if you’re a lifeguard and you have to keep fishing merkins out of the drain. So there you have it. The next time you’re soakin’ up some rays at one of the best Las Vegas pools or are flippin’ through the Las Vegas day club calendar, go “Inception” and think about all the things that have to happen for you to not think about the things happening behind the scenes. And if that last statement just mind freaked you, find comfort in knowing there are plenty of Las Vegas tours, Las Vegas shows and Las Vegas nightclubs out there to help you unwind. ← Previous Post: Mardi Gras in Las Vegas, what could go wrong?